Wednesday 26th April 2017 – 11.00am – Murray MacGregor. 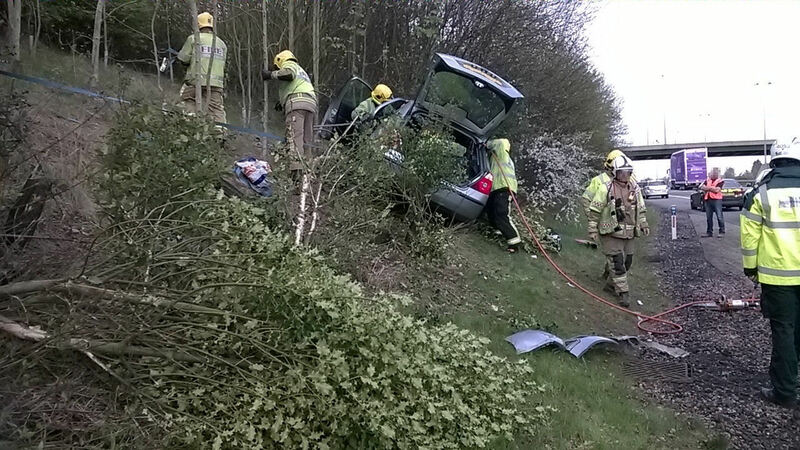 A woman has been alerted into a major trauma centre after a car left a road and struck a tree. The incident happened at about 7.15pm on Tuesday evening on Burton Hills Road, Burton Dassett, near to The White House. A West Midlands Ambulance Service spokesman said: “When crews arrived they found a car that had left the road, struck a tree and come to rest back on the carriageway; it had suffered significant front end damage with debris across the road. “The driver, a man estimated to be in his 30s, was out of the vehicle and uninjured; he was left helping police with their enquiries. Tuesday 25th April 2017 – 5pm – Jamie Arrowsmith. A car driver has been taken to hospital following a collision between a car and a double decker bus this afternoon. A Patient Transport Service vehicle came across the incident on Robin Hood Road in Willenhall, Coventry at 2.50pm. One ambulance and a paramedic officer were then sent to the scene. A West Midlands Ambulance Service spokesman said: “Crews arrived to find a car that had suffered severe damage in collision with a bus. 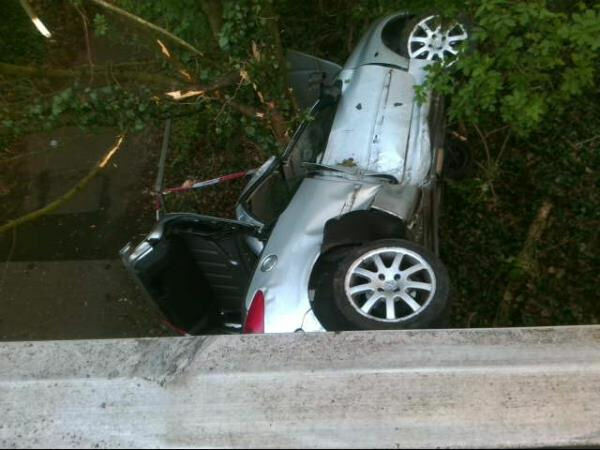 “The car driver, a man believed to be in his 40s, managed to free himself from his vehicle. “He was treated for suspected broken ribs and a hand injury and transported to University Hospital Coventry and Warwickshire. “There was one patient from the bus, a man believed to be in his 60s who had suffered a hand injury. He was treated in a nearby medical centre and did not require onward transport to hospital. Monday 24th April 2017 – 10am – Jamie Arrowsmith. Three people have been treated at the scene of a collision between a car and a stationary car before being transported to hospital last night (Sunday). 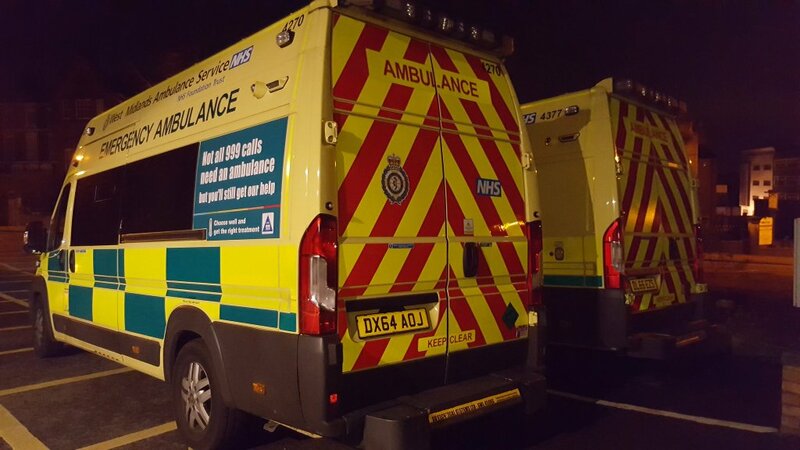 West Midlands Ambulance Service was called to the A5 in Fazeley, Tamworth just before 11.10pm and sent three ambulances, a paramedic area support officer and a rapid response paramedic to the scene. A West Midlands Ambulance Service spokesman said: “Crews arrived at the scene to discover three patients who had been injured in the collision. 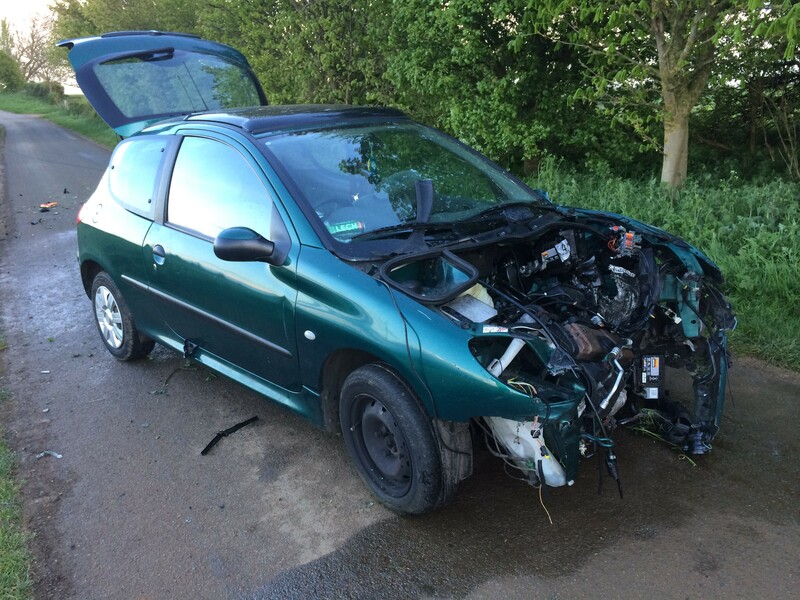 “There were two patients in the stationary vehicle, both men in their 20s. “The passenger got himself out of the car by climbing out of the window. He was treated for chest and arm pain. 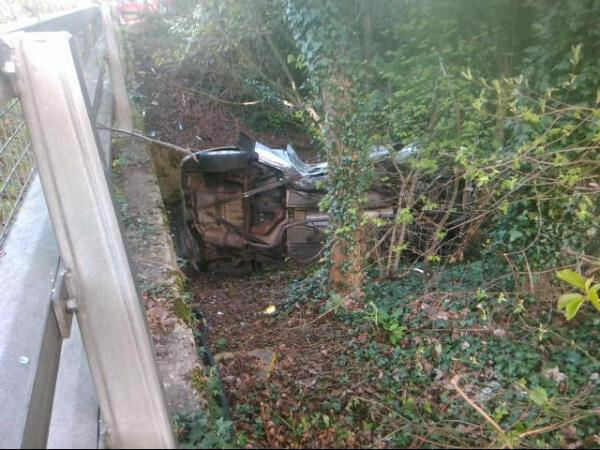 “The driver, who managed to get himself out of the car, was treated for back pain and leg pain. “The driver of the second car, a woman believed to be in her 20s, was out of the car on arrival of ambulance staff. She was treated for minor back injuries and a hand injury. Friday 21st April 2017 – 10.30am – Jamie Arrowsmith. A woman has been treated for serious injuries after her car caught fire following a collision with a bridge last night (Thursday). West Midlands Ambulance Service was called to the junction of the A5 and Horsebrook Hall Lane between Gailey and Weston-Under-Lizard in South Staffordshire, shortly after 8pm. An ambulance, a paramedic area support officer and a MERIT trauma doctor were sent to the scene. A West Midlands Ambulance Service spokesman said: “On arrival, crews discovered a car that was well ablaze and a woman believed to be in her 30s who was out of the vehicle. “She was suffering from a slightly reduced level of consciousness and treated for a fractured leg. She had also suffered burns to her legs, which ambulance staff treated her for at the scene. “The woman was given pain relief before being transported to Queen Elizabeth Hospital, Birmingham for further treatment. Thursday 13th April 2017 – 4.45pm – Murray MacGregor. 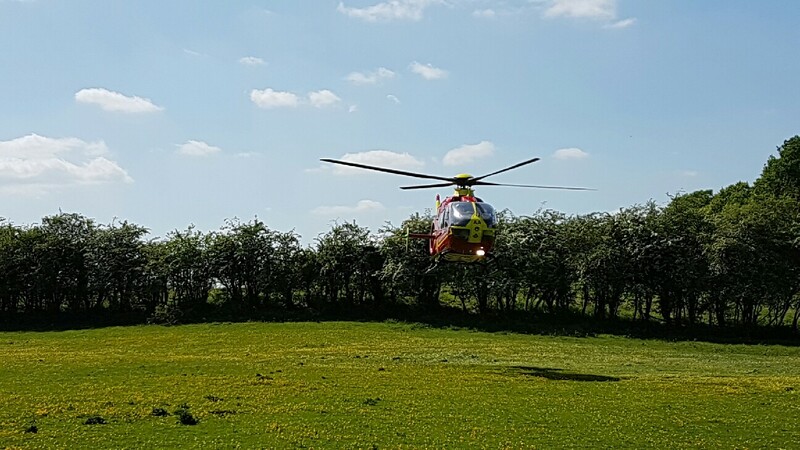 A trip in an air ambulance to hospital with a nasty ankle injury was hardly what one woman imagined when she went out for a walk with her family this lunchtime. West Midlands Ambulance Service was called to the top of the path at Kinver Edge at about 1.30pm today (Thursday). A 40-year-old woman had tripped and gone over on her right ankle resulting in a suspected fracture dislocation. A West Midlands Ambulance Service spokesman said: “An ambulance, the Hazardous Area Response Team and the Midlands Air Ambulance from Cosford were all dispatched to the scene. “Given the location, the air ambulance arrived first and after quickly assessing the patient, stood the other resources down. “The woman received treatment from the aircrew including a trauma doctor, before having her leg splinted. A member of the public in a 4×4 then assisted by helping to move the woman to the aircraft before the short flight to New Cross Hospital in Wolverhampton. Tuesday 11th April 2017 – 1.20pm – Jamie Arrowsmith. A woman who was found lying in the road, unconscious, has been taken to one of the region’s major trauma centres following treatment from the ambulance service. The 999 call to West Midlands Ambulance Service, made at 10.50am, reported that a woman had fallen from a moving car on Churchill Avenue, Coventry. An ambulance, a paramedic area support officer and the Warwickshire and Northamptonshire Air Ambulance attended the scene. A West Midlands Ambulance Service spokesman said: “On arrival at the scene, crews discovered a woman, believed to be in her 20s, lying unconscious in the road. “She was assessed, carefully moved on to the back of the ambulance and treated for a head injury which is not thought to be serious. Tuesday 11th April 2017 – 9am – Jamie Arrowsmith. A woman has died following a house fire in the early hours of this morning (Tuesday). 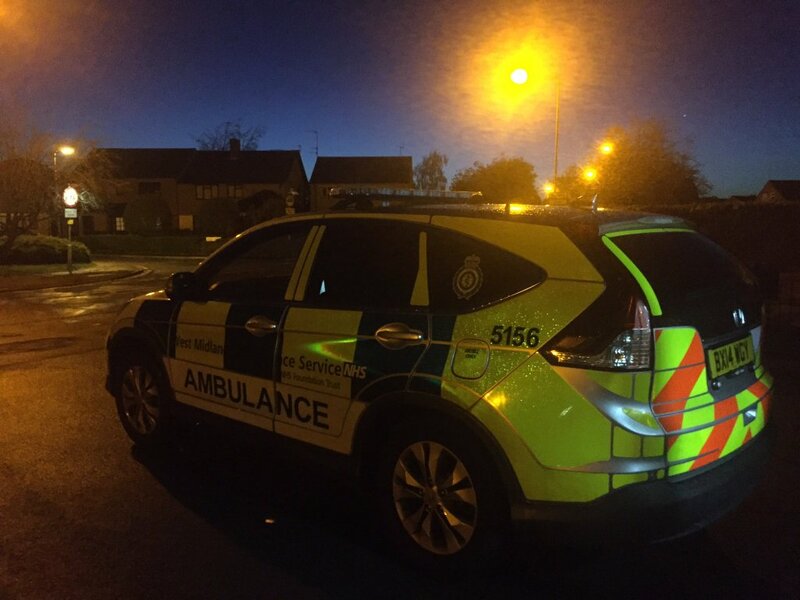 West Midlands Ambulance Service was called to Turin Road in Newcastle shortly after 1.30am. An ambulance and a paramedic area support officer attended the scene. A West Midlands Ambulance Service spokesman said: “When ambulance crews arrived at the scene the house was well ablaze. “Firefighters entered the property and managed to get the woman out, taking her outside to waiting ambulance staff. “The woman was in cardiac arrest and crews immediately began CPR. “However, unfortunately it soon became apparent that nothing could be done to save her and she was confirmed dead at the scene. Monday 10th April 2017 – 8.58am – Murray MacGregor. One man has died and two others have suffered serious injuries after a crash between a car and a lorry. It happened in Leamore Lane, Walsall at about 11.10pm last night, Sunday. A West Midlands Ambulance Service spokesman said: “On arrival, ambulance staff found a car that had suffered extensive damage. “Unfortunately, one of those in the car was found to be in cardiac arrest. He was pulled from the vehicle with the help of other road users who had stopped and advanced life support was carried out by ambulance staff but sadly it was not possible to save the man and he was confirmed dead at the scene. “A second man in the car had suffered multiple injuries. He was sedated at the scene by the doctor and had splints attached before being taken on blue light to the major trauma centre at the Queen Elizabeth Hospital Birmingham; the doctor travelled with the crew. “A third occupant had also suffered multiple injuries. He was also taken to the major trauma centre on blue lights. Friday 7th April 2017 – 11.45am – Claire Brown. A woman, whose car went off the road and ended up more than 50ft down a hillside, has miraculously escaped serious injury. 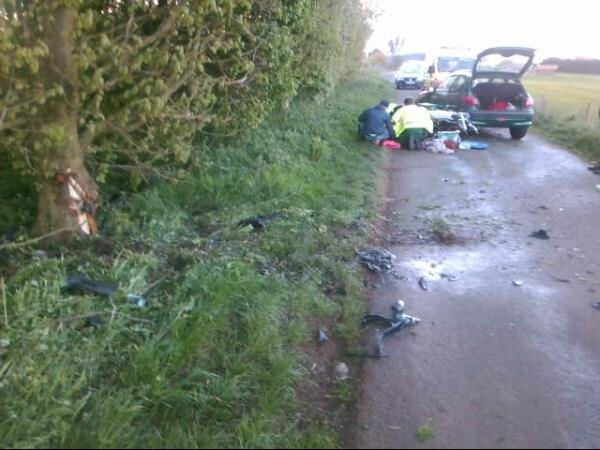 West Midlands Ambulance Service was called to the B4232 Jubilee Driver in Upper Colwall, Malvern, at 8.30am this morning. An ambulance and a paramedic area support officer attended along with police and fire colleagues. A West Midlands Ambulance Service spokeswoman said: “When ambulance staff arrived they found a car on its side more than 50ft down a steep hillside being secured by the fire service. 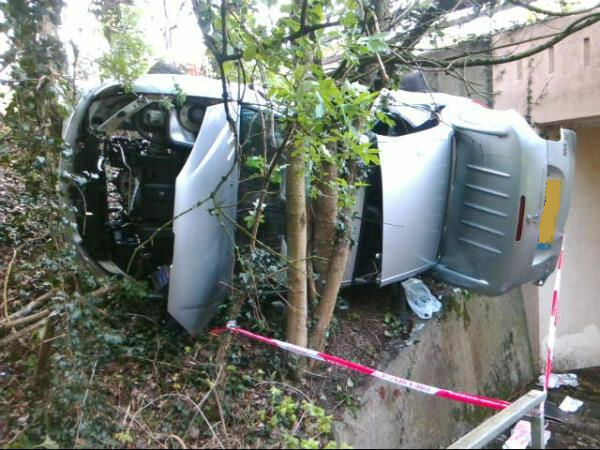 The car’s fall had been broken by a tree which prevented it going any further down the hillside. Thursday 6th April 2017 – 11.30am – Murray MacGregor. Two motorcyclists have been injured, one potentially seriously after two separate crashes within moments of each other on the same stretch of road. The collision happened on the A5 at Watling Street in Cannock at about 4.45pm on Wednesday afternoon. 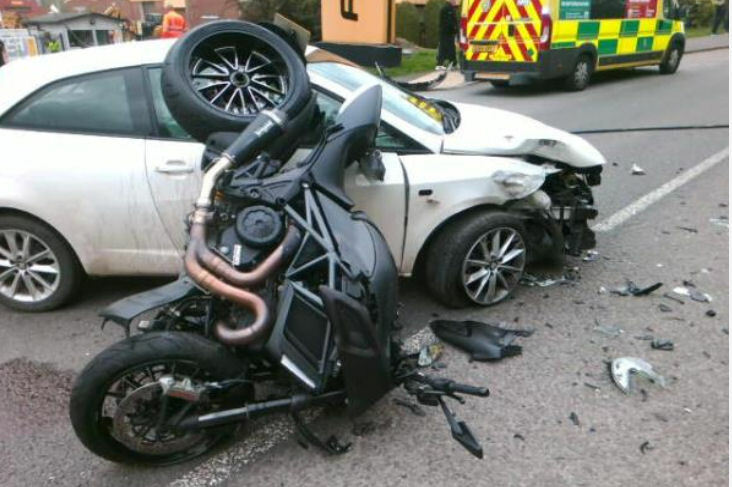 A West Midlands Ambulance Service spokesman said: “The two collisions happened close by at approximately the same time and both involved a car and motorbike. “The first incident was much more serious. 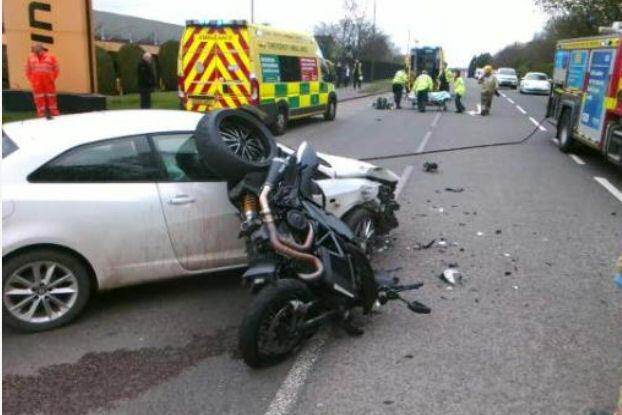 The motorbike collided with the front offside corner of the white car. The rider was found about 15 metres away in a dazed condition. “The 46-year-old man was complaining of pain in left foot and elbow but had no other obvious injuries. However, the crew took no chances and treated him for a head injury as well. He was immobilised and taken on blue lights to New Cross Hospital for further assessment and treatment. “In the other collision, a car suffered front offside damage and the bike left sided damage. The rider, a 56-year-old man was complaining of left hip, leg and knee pain, but after assessment chose not to go to hospital. Thursday 6th April 2017 – 8.25am – Murray MacGregor. A motorcyclist has been airlifted to a major trauma centre with critical injuries after a crash with a car. It happened near the junction of School Road and Chilton Road in the Yardley Wood area of Birmingham at about 6.10pm on Wednesday evening. Two ambulances, a paramedic area support officer and the Warwickshire and Northamptonshire Air Ambulance were sent to the scene. A West Midlands Ambulance Service spokesman said: “On arrival, ambulance staff found a motorcyclist who had suffered multiple serious injuries. He was being cared for by a nurse form a nearby care home. 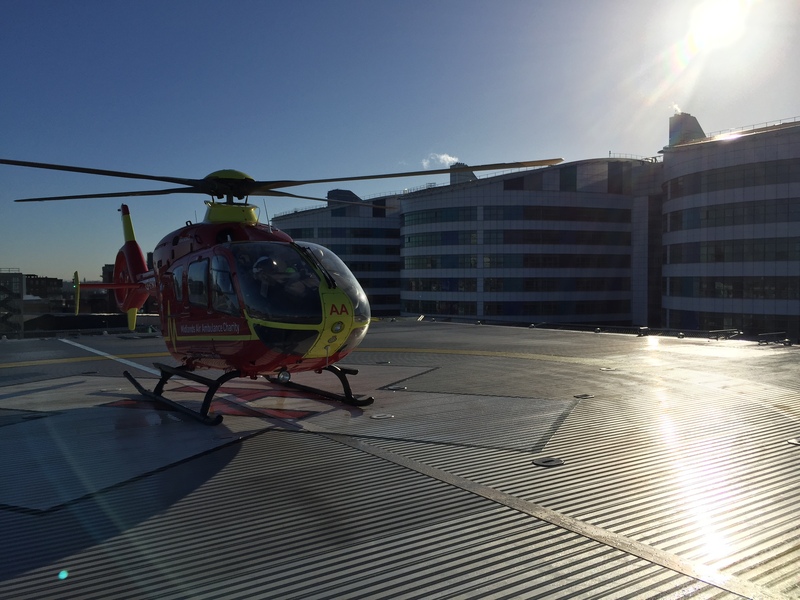 “The man was treated at the scene by ambulance staff, but as his condition worsened he was anaesthetised by the doctor from the helicopter before being airlifted to the major trauma centre at the Queen Elizabeth Hospital Birmingham. Wednesday 5th April 2017 – 4.31pm – Murray MacGregor. 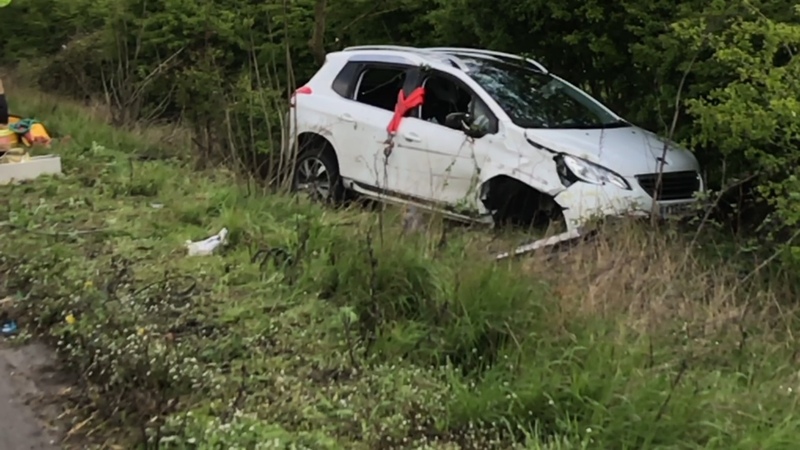 A woman has been injured after her car left the motorway and went through small trees and ended up in a holly bush following a collision with a lorry. 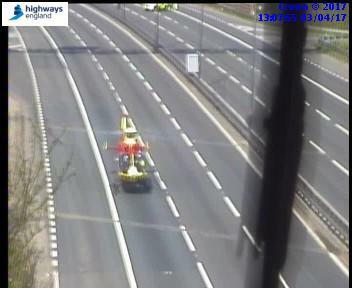 It happened on the northbound carriageway of the M6 Toll between junction T1 and T2 at about 12.15pm today (Wednesday). 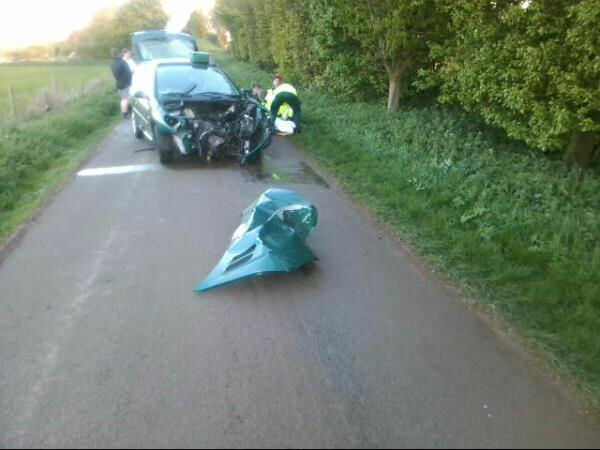 A West Midlands Ambulance Service spokesman said: “The Ford Mondeo had collided with a large goods vehicle. The rear tail lift of the lorry was badly damaged. 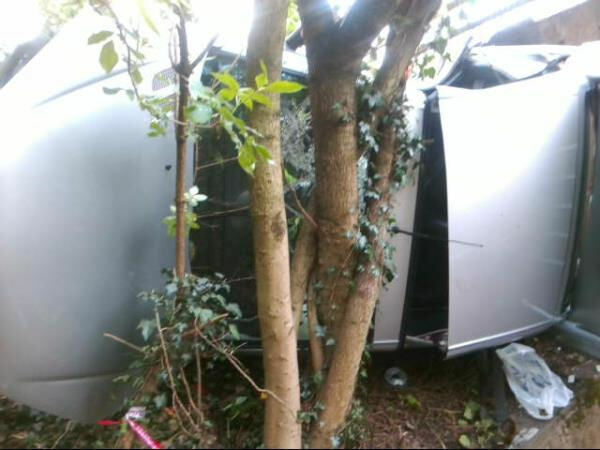 “The car then left the motorway and went up the embankment going through a number of small trees and ending up embedded in a holly bush. “The 41 year old woman driving was briefly knocked unconscious. She was trapped and was complaining of neck and back pain as well as suffering facial injuries. “After being assessed by ambulance staff while still in the vehicle, they worked with firefighters to extricate her. The rear seats were removed and after being placed onto a spinal board, was brought out through the rear hatchback door. “After further assessment and treatment, she was taken to Good Hope Hospital. Wednesday 5th April 2017 – 3.05pm – Murray MacGregor. Ambulance bosses are praising a member of the public who climbed into an overturned car and supported an elderly woman who was hanging by a seatbelt. The incident happened on the southbound M5 between junction 6 and 7 at about 10.15am this morning (Wednesday). 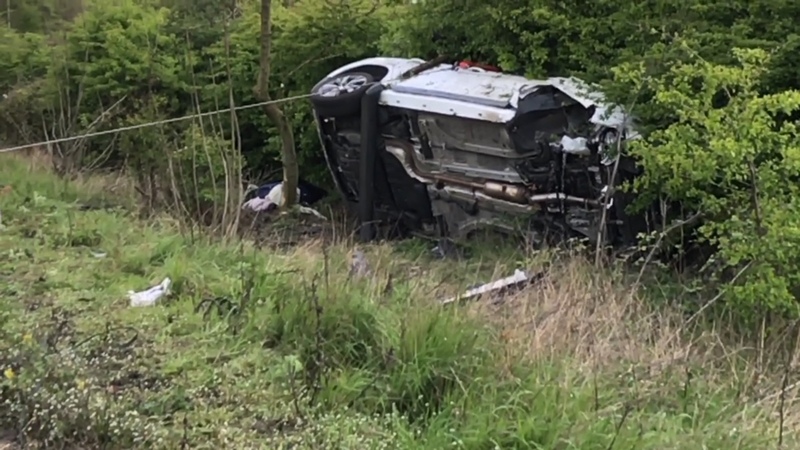 A West Midlands Ambulance Service spokesman said: “People at the scene described the car hitting the central reservation and leaving the road to the nearside, going down an embankment and rolling onto the passenger side into a hedge. “When the first ambulance arrived, the crew found the driver, a 72-year-old woman, trapped and hanging by her seatbelt in the overturned car. However, her weight was being supported by a woman who had climbed into the crashed car. “Ambulance staff took over, and with the help of the fire service brought the woman out safely on a scoop stretcher. “She had suffered facial injuries. After treatment at the scene, she was taken to Worcestershire Royal Hospital. Unfortunately, we do not have details of the good Samaritan. Tuesday 4th April 2017 – 9.30am – Claire Brown. A man has died after falling from a bridge in Birmingham this morning. West Midlands Ambulance Service was called to the A38M Aston Expressway shortly before 4.50am (Tuesday). Two ambulances, a paramedic area support officer and a MERIT trauma doctor attended the scene along with the police. Monday 3rd April 2017 – 6.30pm – Murray MacGregor. 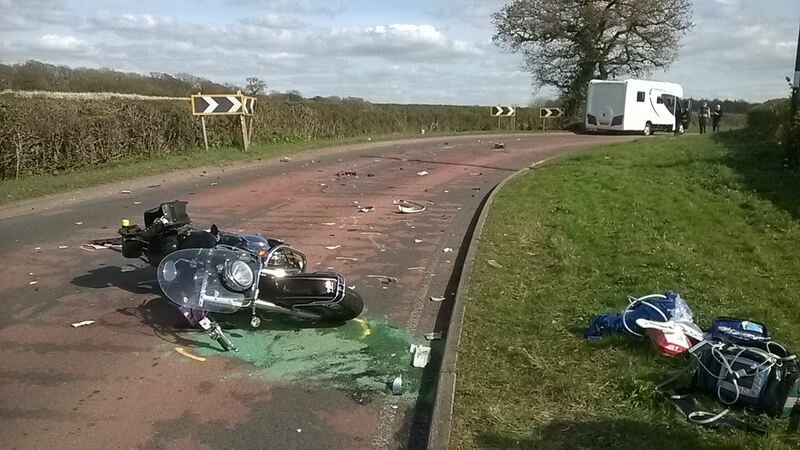 A motorcyclist has been airlifted with a serious leg injury after a crash with a campervan. It happened at about 2.20pm on Monday afternoon on Astley Lane between Astley and Bedworth. A West Midlands Ambulance Service spokesman said: “An ambulance and a senior paramedic officer were initially sent but the crew requested an air ambulance with a doctor due to the patient’s condition. The Warwickshire and Northamptonshire Air Ambulance was sent. “Police officers who were first on scene provided excellent first aid until ambulance staff arrived. “The 59 year old rider had suffered a serious leg injury. “After receiving advanced pain relief, he had his leg splinted and was immobilised before being airlifted to University Hospital Coventry and Warwickshire. Monday 3rd April 2017 – 5.30pm – Jamie Arrowsmith. More than 100 awards were handed out when staff from West Midlands Ambulance Service, volunteers and members of the public attended a ceremony in Dudley for their outstanding actions in helping others and saving lives. The Trust’s annual Long Service and Excellence Awards ceremony, sponsored by Excelerate, Mills & Reeve, Zoll, Higgs and Sons, the University of Worcester, Coventry University and Imprint, took place at the Copthorne Hotel in Brierely Hill on Thursday, 30th March and saw a range of awards handed out including the Queen’s Long Service Medal and Chief Officer Commendations. This year, 12 operational members of staff became eligible for their 20 year Long Service and Good Conduct Medal which were presented by the Lord Lieutenant of the West Midlands, John Crabtree OBE. In addition, 12 staff were commended for 25 years service; ten received certificates for 30 years service; one member of staff was honoured for 35 years in the Trust; whilst a further three were commended their 40 years service. Trust Chief Executive, Anthony Marsh, said: “There is only one ambulance service that has achieved an outstanding rating from the CQC and that is our ambulance service. “That is down to the hard work of every member of staff who shows incredible dedication to providing the very highest level of patient care, something for which I am truly grateful. Lord Lieutenant, John Crabtree OBE, added: “We are hugely fortunate in having such a high quality ambulance service in the West Midlands and I know how important the things are that lead to that, the training, the leadership, the teamwork and the ability to work together to put other people first. All of those skills are clearly evident here in the West Midlands. Sir Graham Meldrum, Trust Chairman, added: “It truly is an outstanding achievement to have received the highest possible rating from the CQC and it is down to your dedication – the sort of dedication that is recognised by the awards being handed out today. In October 2016, Stephen Gennoe, Derek Varden and Herpreet Lally were responding to a reported double stabbing. Whilst en-route the ambulance was rammed by the alleged offender’s car. The alleged offender then got out of his vehicle and started intimidating the crew, threatening them with a knife. It should be noted that Steven was injured in the altercation and that this was Herpreet’s first day at work. PC Leroux made the scene quickly and engaged the offender, putting himself in harm’s way to protect the public and ambulance staff. Following the incident, the crew continued to provide emergency care to the victims on scene. Claire Main was tasked to a cardiac arrest in April 2016 with no further details known. On arrival at the address, Claire walked through the open front door and saw a male standing at the top of the stairs holding a large knife. Claire told him to put the knife down and step aside. She then walked past him out of concern for the patient who was in cardiac arrest and went into another room. Upon entering the room Claire found the person who had made the call and a deceased female. She then bravely proceeded to get herself and the caller out of the property to safety. Shannon Lee attended to a 45-year-old man initially complaining of chest pain. On arrival, the patient was threatening suicide, appeared agitated, anxious and under the influence of alcohol. The patient walked into the kitchen and attempted to stab himself. Shannon acted quickly to disarm the patient, ensuring he didn’t cause himself harm. 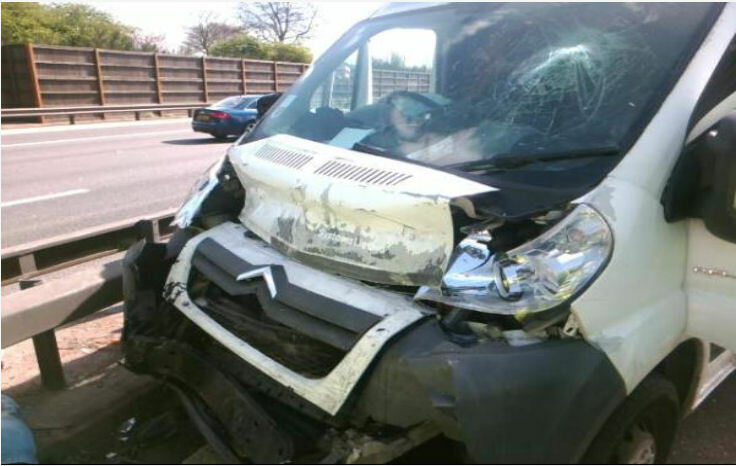 Paul Clarke and Courtney Hewison witnessed a car weaving across the M6 motorway, colliding with a number of barriers. They initially managed to get the car to stop on the hard shoulder but as they approached the car and began speaking to the driver, he sped off. The crew followed and managed to run a rolling roadblock behind the car as it continued to glance off barriers for over two miles before it crashed for a final time. The crew alerted the call centre, activated CCTV on the ambulance and gave a comprehensive commentary on what was happening. Once the car had come to a stop they rapidly assessed the patient who was having a diabetic hypoglycaemic attack and treated him accordingly whilst considering he may have other injuries from the crash. Had it not been for their quick actions in setting up a rolling roadblock there may have been many other innocent motorists caught up in collision with the gentleman’s car as it careered around the carriageway. Samantha Wilyman was tasked to a job where a male was threatening to jump from a bridge. Sam and a WPC made their way onto the bridge to speak to the patient who had self-discharged from a mental health hospital. He was polite and happy to speak to them. He was, however, the wrong side of the barrier. He allowed Sam and the WPC to attach a police “CAS strap” around him while they talked, in order to secure him to the railings. He then, without warning, slid out of the strap in an attempt to jump. At this point, Sam and the WPC hung onto him until further police officers arrived. After a very fraught and anxious struggle they managed to pull the man to safety. The actions carried out were simply above and beyond and if not carried out would have without doubt resulted in very serious injuries, if not death of the patient. Michael Hipgrave – Clinical Team Mentor, Aston; Jennifer Hipgrave; Yasmin Bickerton. Off duty paramedic Mike Hipgrave and his wife Jennifer Hipgrave were out shopping when they overheard shouting and calls for help. An 18-month-old girl was found to be choking and in cardiac arrest. Mike and Jennifer immediately began performing CPR and ultimately were able to save the girl’s life. Thankfully, little Sophia continues to thrive after her ordeal whilst mum, Yasmin, has organised life support courses to pass on the lifesaving message to others. She has also raised £150 which has been donated to the Trust as a thank you for saving Sophia’s life. Jan Vann receives recognition for her part in the BAFTA Award winning Children’s TV show, Operation Ouch. The programme finished its fourth series (ten episodes in each series) with Jan being featured in every single episode, highlighting to children what paramedics do every single day as she is followed by a camera crew. It is the most watched TV programme on children’s BBC and she has even featured in a ‘Puberty special’ aimed at older children. Maverick TV put together the programme in conjunction with the Trust’s press office. It is the only TV programme the Trust has been involved with that is aimed at children and is the only BAFTA award winning show the Trust has been involved with. Tracy Oakley is a valued member of staff and a talented Emergency Care Practitioner. Nothing is ever negative with Tracy; she promotes a positive attitude to every part of the job and extends this in her role as a mentor for budding students. For some time, Tracy has acted as an allocated mentor for students who may need extra help and guidance in clinical terms to achieve their full potential. She is an inspiration to people in this job and her history in emergency and urgent care builds a wealth of experience making her an absolute asset to anyone she works with, and the patients she serves. Tracy regularly goes out of her way and works hard to fulfil her leadership and mentoring responsibilities whilst setting a critically high benchmark for students who carry her name forward as their mentor. Monday 3rd April 2017 – 2.43pm – Murray MacGregor. 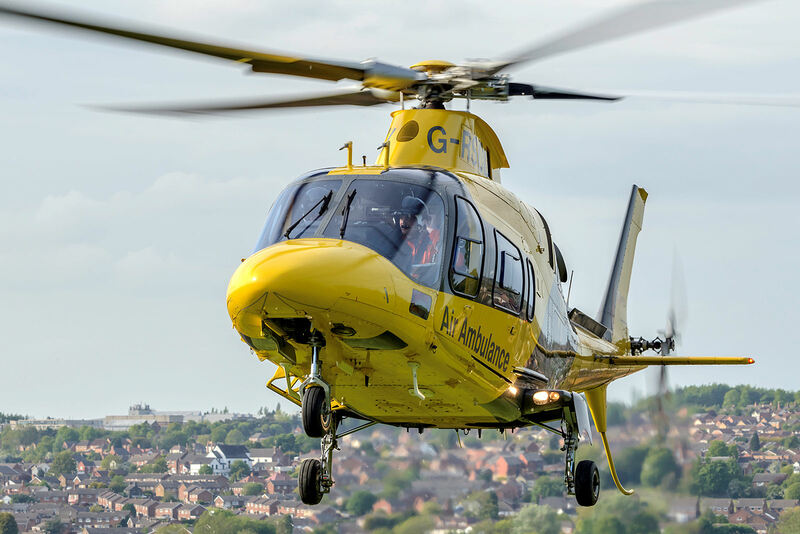 Two people have been hurt, one potentially seriously, after a crash on the M6 motorway, which also saw an air ambulance land on the carriageway. The incident happened on the northbound carriageway between junctions 6 and 7 at just after midday. Two ambulances, a paramedic area support officer, a BASICS Emergency Doctor and the Midlands Air Ambulance from Cosford were sent to the scene. A West Midlands Ambulance Service spokesman said: “On arrival, ambulance staff found a Citroen box van that had front end damage and a small car with rear end damage. Both had ended up against the central reservation. The van also had a ‘bullseye’ on the windscreen. “There were two patients from the van; a 49 year old woman was initially unconscious but after being brought out of the vehicle started to come round. She was treated for a potentially serious head injury. After being immobilised, she was taken on blue lights by land ambulance to the major trauma centre at the Queen Elizabeth Hospital Birmingham. The aircrew travelled in the ambulance given the state of the patient’s condition. 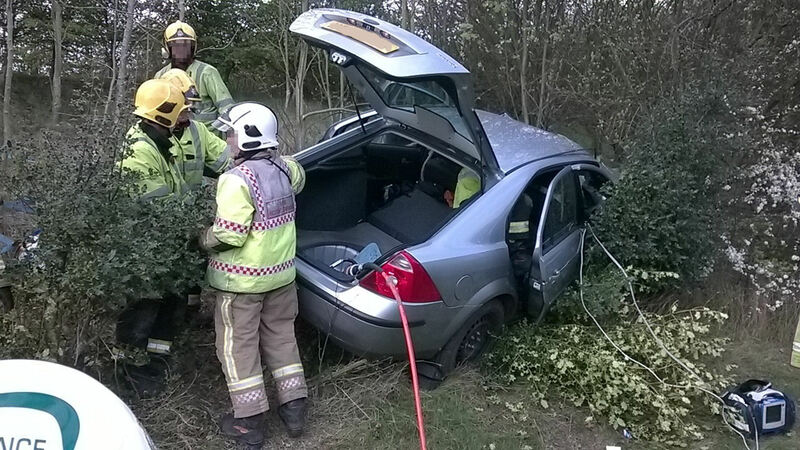 “A 46 year old man from Hayes in Middlesex had managed to get himself out of the vehicle himself. He was treated for neck pain and was immobilised before being taken to Heartlands Hospital. Monday 3rd April 2017 – 11.02am – Murray MacGregor. 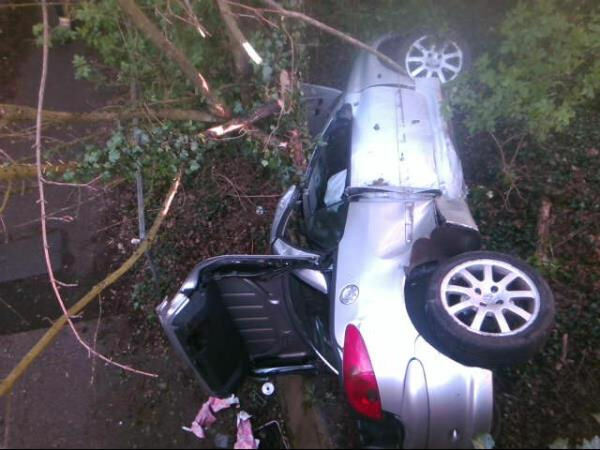 Three women have escaped serious injury despite the car they were in crashing over a bridge and coming to rest in some trees. The incident happened at about 6.35am on Sunday morning on Ravensbank Drive, in Redditch. A West Midlands Ambulance Service spokesman said: “When crews arrived, they found a car lying on its side against a tree off the side of a bridge. “The three women inside had managed to get out of the vehicle themselves and were back up on the roadside. “The driver, a 35 year old woman was treated for glass to the eyes, abrasions to both legs and possible back injuries. She was immobilised before being taken to the Alexandra Hospital in Redditch. “The 39 year old woman in the front seat had a head injury and pain in both legs. She was also immobilised and taken to the same hospital. 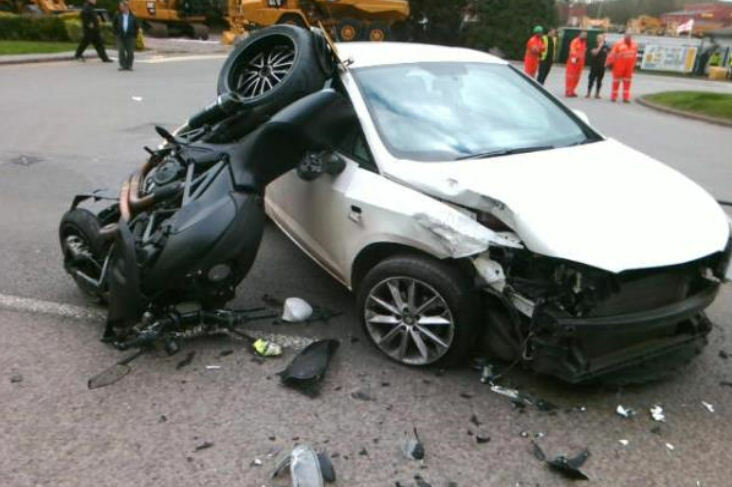 “The rear seat passenger, a 29 year old woman, had back pain and a head injury. She was also immobilised and taken to the Alexandra Hospital.